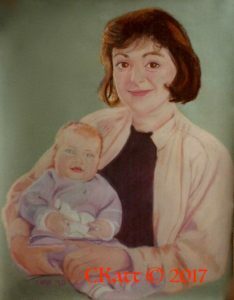 I really enjoy doing portraits of people and children, but I think this was lost in a fire. Luckily I made a record of it. This is a pastel portrait on pastel Canson paper. Alyson is all grown up now. Baukje has a long and distinguished career as a Special Education teacher, school Principal and specialist in main streaming special education students in Friesland in the Netherlands. Baukje has also been a language teacher. Having had a Standard Poodle, whose sire was a hunting champion, I was inspired by this photo of Gary Scovel and his poodles, Beau and Scout. Poodles historically are bird dogs. I contacted him and asked permission to use the photo, which his friend took. 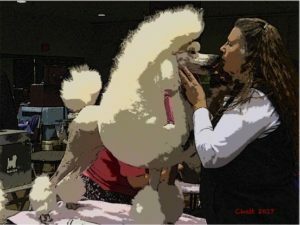 Standard Poodles are marvelous dogs with many fine qualities. The characteristic French style cut of their hair which is seen in show poodles originates in the hunting fields of France. The hair (not fur) on there chest and joints protects them from the brush and cold water while hunting. Historically speaking a ribbon holds their topknot and identifies the dog in the field to the owners by the color. 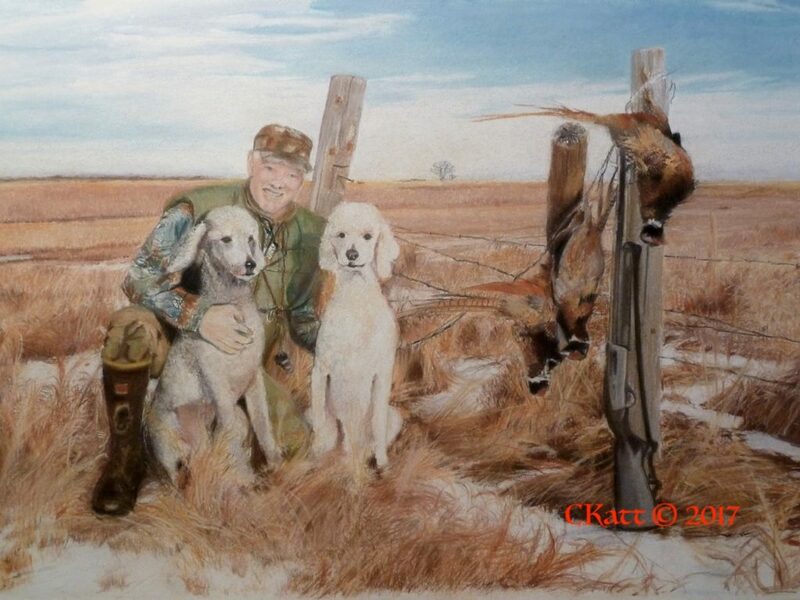 This work above combines pastel chalk and pastel pencil to render this scene of pheasant hunting. 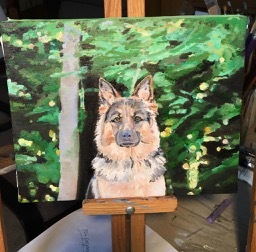 the portrait was inspired after I viewed an old Dutch Master painting of dogs with their owner. Dog portraits are fun to do. 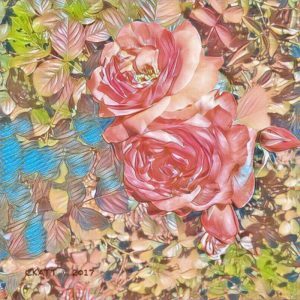 This one was started with acrylic paint to rough in the painting. This photo of the second stage is where I start to lay in the oil paint color. I am using oil paint for the finished portrait. Working with a small format canvas has its challenges. One small stroke can change the expression. Sascha has a very serious look. She is a very sweet family dog, who likes nothing better than carrying a stick in her mouth and shaking it back and forth while walking with you on her country road. 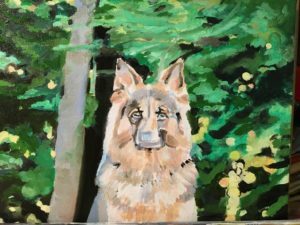 This painting, from a photo her Mom took of her, reflects her serious side and her dignified bearing as her family’s protector.